The Allies launched a naval expedition to take the Gallipoli Peninsula with the overall objective of capturing Constantinople. In November 1914 The Illustrated London News reported that Turkey had declared a “holy war” against the British Empire, France, Russia, Serbia and Montenegro. By 1914, Germany was Turkey’s only true ally amongst the European great powers. Over the years the German Empire had provided Turkey with sound military advice, commercial investment and had even sold battle-ships to them to replace the two Turkish dreadnoughts seized by Britain after the outbreak of war. Consequently, when Turkey entered the Great War she entered on the side of Germany and the Central Powers. The Illustrated London News stated that Turkey had become a “Germanised Belligerent” who had been “lured into war by Germany”. In December 1914, Lord Kitchener received a request from Russia to help relieve their forces who were under attack from Turkish troops in the Carpathian Mountains. First Lord of the Admiralty Winston Churchill, suggested that a new front be opened in the Dardanelles. By taking control of the Dardanelles and the Gallipoli Peninsula, the Allies would take some pressure off of the Russian forces whilst making it possible to launch an offensive against Constantinople (Istanbul). If Constantinople was taken, Turkey would be knocked out of the war. The naval attack began on 19 February but bad weather caused delays and the attack was abandoned. The ILN reported that on 25 February the Queen Elizabeth, Agamemnon, Irresistible and Gaulois began bombarding the forts at Cape Helles, Sedd El Bahr, Orkhanieh and Kum Kalessi with limited success. It wasn’t until 18 March, however, that the Allies made a major effort to force open the Dardanelles. Troops began landing on 25 April 1915, but the Turkish forces had had ample time to reinforce their fortifications and raise their defending armies. The taking of “ANZAC Cove” by Australian and New Zealand troops received ample attention in the British Press and was portrayed by the ILN as a “grand feat of heroism”. At the same time the British tried to land at five points around Cape Helles, but only managed gain a foothold in 3 of them. On 7 August a new battlefield emerged when the British landed at Suvla Bay. However, both the landing and the ensuing offensive proved to be ineffectual after the Turks successfully countered the Allied attack. after months of fighting the campaign was all but finished, though it would take another four months to come to a complete conclusion. Ironically the evacuation was one of the few aspects of the entire campaign that could be considered a complete success. 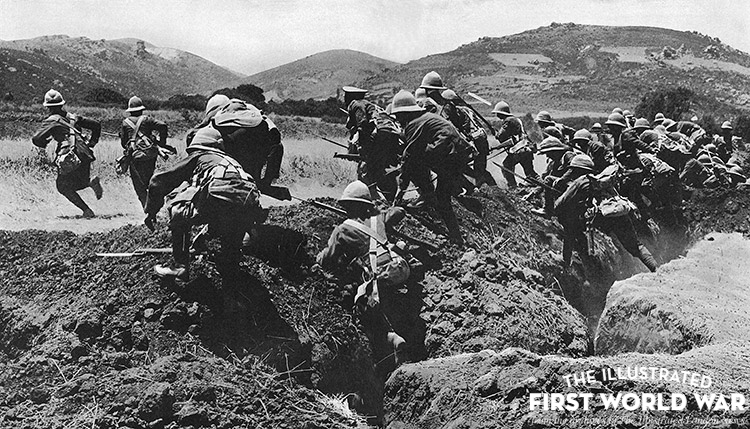 The Gallipoli Campaign was one of the greatest disasters for the Allies in the First World War. Huge resources were diverted from other fronts, the Allies lost over 200,000 soldiers – it was such a catastrophe that it prompted Churchill’s resignation. Indeed, the campaign served primarily to buttress Turkish military prowess and to deliver Allied troops to the slaughter.